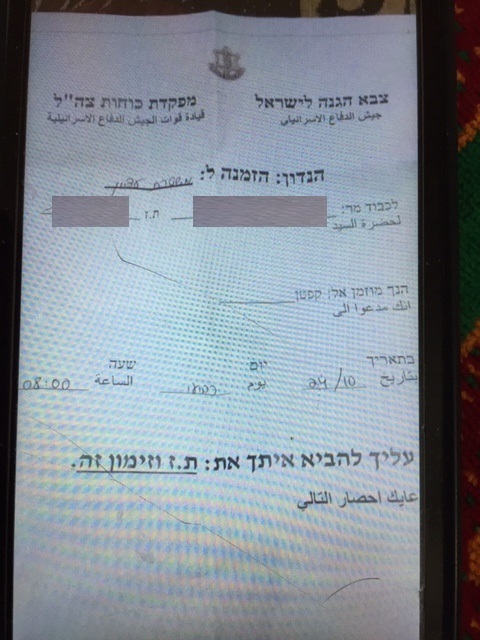 Later that morning my father’s cousin gave us the summons which was written in Hebrew. We could read the date and the time and we concluded I had to go to the police station in Etzion settlement at 8:00 a.m. on the same day. I did not go to school and instead I went to the police station with my father. We arrived at the station at 7:30 a.m.
My father and I were allowed into the police station compound where we waited until around 10:00 a.m. Then we were taken to another part of the police station where a soldier searched me in front of my father. He made me lift my shirt up exposing my back and my belly. Then I was taken inside the building with my father where we both waited. At around 10:30 a.m. an interrogator took me to a room but he did not allow my father to accompany me. There were two interrogators in the room and they had a computer and a voice recorder. 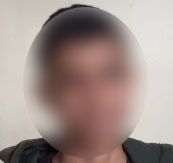 As soon as I entered one of the interrogators told me I was a member of a gang made up of 10 boys who throw stones and Molotov cocktails at soldiers. I denied the accusation and told him I do not throw stones. The interrogator laughed sarcastically. Then the two interrogators started to chat to each other in Hebrew. Then they both looked at a photo album and one of them said to me he had a picture of me and the other one agreed the person in the photo looked like me. They did not show me the photo. Then one of the interrogators wanted to know why I lied to him. He told me telling lies was forbidden in his office. He told me if I told the truth he would send me home. I told him I do not throw stones and that I am focused on my school work. This lasted for about 15 minutes and then I was taken outside where I waited in the sun. The interrogator told me to shut up and not to say a word and that if I did soldiers would take me to the basement and beat me up. About 15 minutes later I was taken to another room. The interrogator told me he wanted to send me to Ofer prison and that I had the right to speak to a lawyer. He called a lawyer for me and the lawyer told me not to worry and not to confess even if they show me photographs. He told me they would try to scare me but that I should not confess. A short time later the interrogator took me to another room and told me to turn my face to the wall. Then the lights were turned off and I was left by myself in the dark. I could hear the sound of the door lock when the interrogator left the room. Then somebody kept turning the lights on and off. It was a scary atmosphere. Sometime later, not so long, I was taken back to the first room. The interrogator then showed me a photos of a boy and told me it was me. I denied it. Then he showed me more photos. Then he brought my father in and showed him the photos before telling him to leave. After my father left the room the interrogator told me my father had confirmed one of the photos was of me. I agreed that it was me in one of the photos but before I could finish my sentence to say the photo did not show me throwing stones he interrupted and told me I had confessed. Then the interrogator started showing me more photos and wanted me to tell him the names of the boys in the photos. I told him I did not know any of them. Then he focused on two boys and told me he was sure I knew them and wanted me to give him their names. When I told him I did not know them he raised his voice at me and accused me of lying. I was scared of him when he raised his voice at me. He then pulled out his gun and put it in my face and cocked it. I froze and could not utter a word. He screamed at me asking me why I was not saying anything. Then he told me my father was going to pay a fine of 500 shekels and I would then be released. He took me outside and made me sit on a seat for about 30 minutes. During this time I was taken to a room and somebody locked the door. That person stayed in the room and started to type on a computer. Then he took four photos of me and took a DNA sample from my mouth. Then he wanted to take my finger prints but I refused. He did not ask me to sign any documents. About 30 minutes later I was taken outside where I met my father and we both went home. 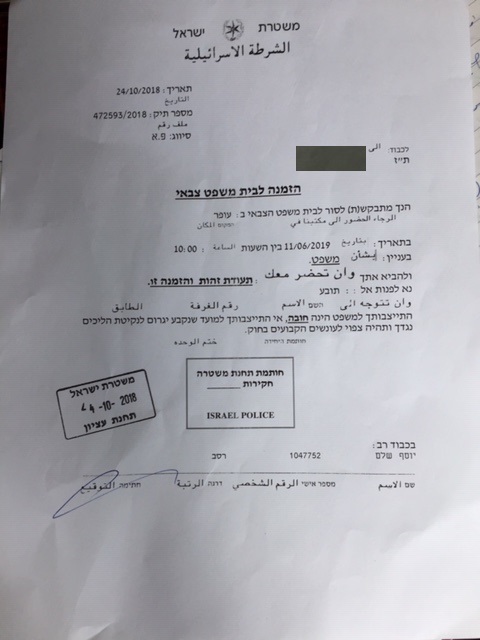 It was around 3:00 p.m. My father told me a policeman gave him a summons for me to go to Ofer military court on 11 June 2019 at 10:00 a.m. for a hearing. The summons was written in Hebrew.